I got into a pretty extensive conversation today with a fellow coach about the frustrations and fads of figure skating boots and blades. Note, that starting a conversation on this topic with another skating professional can be as risky as some of the political conversations happening on social media right now. There are opinions. Science. History. And of course, there’s money. Thankfully, this coach and I were in a whole lot of agreement. We are cult-followers of our favorite company, but we’re out to suit the skater (egos out the door…mostly) for their individual needs and preferences. When it comes to purchasing—or rather, investing in—a pair of figure skates there is a lot to consider. Level, price-point, experience, and skate engineering all play a role in the decision. And when they can cost $1000+ a pair, this is not a transaction that’s innocent from business and capitalist influence. So where is a skater to begin? Rent your skates. Seriously. 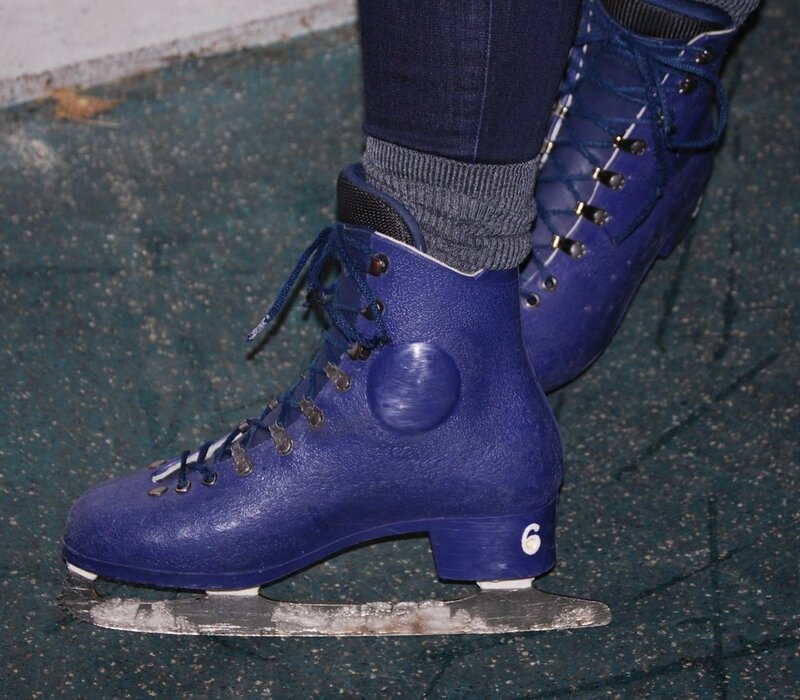 They come in styles of totally plastic to totally cushy and broken-down (at best) but your ability to move on the ice won’t be determined by the quality of skates. Your ability to progress in skill level? Yes. But merely testing your ability to stabilize yourself and move forward and backward across the ice? Rent. those. terrible. likely. also. painful. skates. What you might learn is that you aren’t as nimble on those blades as you imagined. BUT—those skates will still be good enough to get you to the point of feeling stable and comfortable on the ice. What you also might learn is that you are beyond ready to take the ice and practice more technical skills than forward and backward. Once you reach this point of stability and confidence, you’ll know that it’s time to fit yourself into something better. Now’s the time to ask some questions. Is the skater still growing/changing or at a forever size? Is the skater aiming to be generally stable, steady, and strong, or always-aiming for the next levels? At this point, you can still make the purchase generally on your own. Your everyday sports outfitter store will have strong skates for both the progressing figure skater (or hockey player). I have a few skaters who are working on their beginner freestyle elements in skates purchased off of Amazon and they’re doing quite well. THAT, is not a fact most professionals would oft admit. We always hope that advancing skaters will be in the skates that will most aid in their development but unless the boot and blade are harming their body or inhibiting their natural strength and movement, then the skates that they’re in are alright (not to mention that Edea, the biggest fad in skates right now, can be found on Amazon). For $100+ you can find a decent pair of Celebrity, Reidell, Jackson, or other skates in a mass-produced stock-boot-and-blade on display in a sports outfitter store such as Play it Again or Sports Authority. If the skater is taking group lessons and working on basic skills, going through a growth-spurt, and/or generally focused on simply improving their forward and backward movement across the ice, save the money and buy a strong stock boot at your local retailer. This is likely when questions of money, fit, and brand preference can become tough to navigate. Dealers want to make a high commission. Companies want to convince you that their technology is the best. And even some coaches will have a favoritism that could get in the way of your foot’s best fit. But even at this level, before goal-oriented competitions and regular test sessions, a skater can do very well in a company’s stock boot. It just takes getting out of the sports store and connected to the company itself. This is why having a private coach is especially important at this point. Finding a local dealer who is connected to skating companies such as Reidell, Jackson, Harlick, and Graf (to name a few) usually requires the inside scoop. An experienced coach might also have the experience to hook you up with the company directly, too. Overall, at this level a skater should be able to order a quality stock boot from a focused skating company for way south of $1000. The other often overlooked upside of purchasing a stock-boot? They can usually be returned if the fit isn’t right. Until the skater is 100% committed to the sport and the practice, this option to return the skate for the correct size is a must-have. This conversation warrants a post all on its own. If you’re a skater working on double jumps, combination spins, U.S. Figure Skating tests, and qualifying competitions, then your investment in figure skating boots and blades is an investment and a very personal relationship. I will leave you with this, though: speak to a coach with whom you have a strong connection, such as your private coach, coaches they work with closely, or your skating director. While coaches almost always have a passionate preference for skates (mine: Harlick boots and John Wilson blades) not all coaches have looked at scientific studies surrounding injury patterns of certain boots or are aware of commission rates from certain companies (this hugely influences dealer relationships). And some coaches have. And some coaches will have preferences that won’t impact their advice to you. But MOST coaches will put their care for you over their preference for skate company.